Another day, another biopic. Fortunately, Molly’s Game features the fascinating woman known as Molly Bloom and her time running a lucrative poker game. And who better to play this powerful woman than Jessica Chastain, a scene stealer in her own right that gets to sink her teeth into some fantastic dialogue. What else would you expect with acclaimed writer Aaron Sorkin behind the screenplay and for the first time, in the director’s chair. There is plenty to be excited about with Molly’s Game and for the most part, it delivers. The true story of Molly Bloom (Jessica Chastain), a beautiful, young, Olympic-class skier who ran the world's most exclusive high-stakes poker game for a decade before being arrested in the middle of the night by 17 FBI agents wielding automatic weapons. Her players included Hollywood royalty, sports stars, business titans and finally, unbeknown to her, the Russian mob. Her only ally was her criminal defense lawyer Charlie Jaffey (Idris Elba), who learned there was much more to Molly than the tabloids led people to believe. If one wants to make it a little easier on themselves when making a movie, get a story worth telling and characters worth watching. With Molly’s Game, writer-director Aaron Sorkin gets both and runs with it. Sorkin crafts this story into a mishmash of present and past that is very reminiscent of The Social Network, but doesn’t quite work as well. But it does provide an exuberant environment in which Sorkin’s dialogue can thrive like no other. When the dialogue works, so do the performances. Jessica Chastain, as good as she has been, is at the top of her game here, delivering a fierce performance while chewing up dialogue like crazy. She owns the film and it’d be shocking if her name isn’t at least under consideration for the in-progress award season. As far as her support goes, Idris Elba finally gets a role in 2017 worthy of his talents and actually showcases just how good he can be. Kevin Costner, in a limited role, gets his moments as well as the deep seeded motivator of a father to Molly Bloom. One thing is for certain amongst all the performances; Aaron Sorkin knows how to get the best from his actors. Sorkin’s unbelievably crafted and meticulous writing is mesmerizing. It’s captivating and stimulating like few writers can provide. However, the dramatic tension falters a bit here by showing the audience where exactly the story is going before its played out. But the fact that the over two-hour film is still engaging and interesting to watch is a testament to Sorkin’s abilities. He knows his strengths and plays into them as a first-time director, matching a visual quality to his screenplay for a change. Overall, Molly’s Game presents Aaron Sorkin with some excellent material to wrap his exceptional dialogue around. Jessica Chastain and Idris Elba chew up the dialogue and spit it out in performances that are, if nothing else, worthy enough of being in the award conversation. There are problems with the structure and the disservice it does to the story, but the film as a whole is a winning hand for the long-time writer turned director. 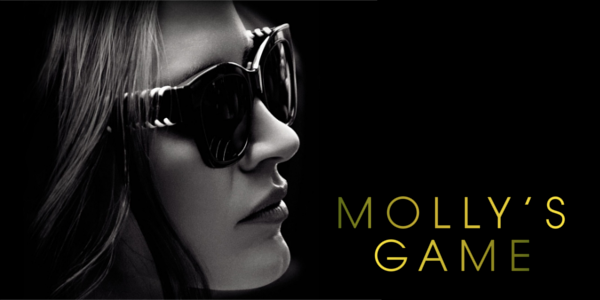 So what did you think of Molly’s Game? Have you seen it? Are you interested in seeing it? Share, subscribe, comment below, and as always return to I Am Sam for weekly reviews and insight.